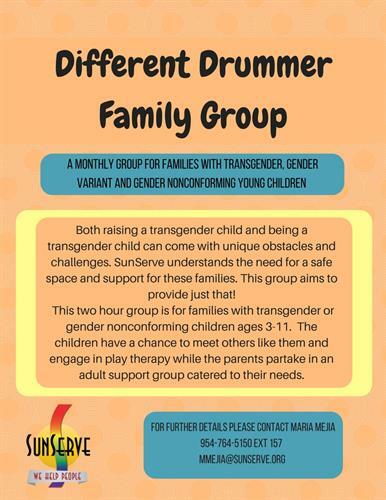 A monthly group for families with transgender, gender variant, and gender non-conforming young children. As if marching to the beat of a different drummer, gender non-conforming children are just trying to be true to themselves, often at the expense of ridicule and disapproval. If you have a child between 3-11 years old and these are your concersn, Different Drummer Family Group may be just what you need! This unique group gives you the opportunity to connect with other families like yours and it is a place for your child to meet children whose experiences mirror their own.